Advance Praise for The Quiet Crisis"The Quiet Crisis presents an urgent plea for reform in Americaa?s higher education systems from an experienced educator who understands what learning is about and its importance to our democracy." -Leon E. Panetta, Director, The Panetta Institute for Public Policy"Peter Smitha?s The Quiet Crisis takes on a daunting task-convincing America that its cherished higher education system, the envy of the world, is flawed. It would seem a foola?s errand if it were not for the clear and compelling case that he puts forward, his extensive experience as an academic and as a policymaker, and the urgency of reshaping the system of higher education to meet the enormous-and growing-expectations that society has thrust upon it." -Frank Newman, Visiting Professor of Public Policy, Center for Public Policy & American Institutions, Brown University"By writing in such a refreshing personal and passionate way about the connection between teaching and the survival of the American dream, Peter has given the national discussion about the reform of teaching a shot of maral urgency." -Russell Edgerton, Director, The Pew Forum on Undergraduate Learning"This book offers a critique of the current state of affairs in higher education and a vision for the future by an individual uniquely qualified to make such judgments." -Arthur E. Levine, President, Teachers College, Columbia University"Peter Smitha?s new book has important lessons for everyone interested in American higher education." -Tom Ehrlich, Senior Scholar, The Carnegie Foundation for the Advancement of Teaching"Peter Smith uses his personal, professional, and political experiences to describe how higher education is failing America. We need to have a national conversation about his message." 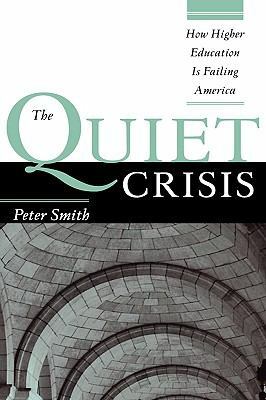 -Ted Sanders, President, Education Commission of the StatesSmith, Peter is the author of 'Quiet Crisis How Higher Education Is Failing America', published 2008 under ISBN 9781882982707 and ISBN 1882982703.